The right skincare products for your skin type can make a real difference to how your face looks and feels. With the right care, whatever your type, your skin can look radiant, moisturised and beautiful. Not sure which you are? Take a look at our information below! Combination skin is a mix of two types. Areas on your forehead, chin and nose (sometimes called the T-zone) tend to look shiny and have impurities, while the skin on your cheeks is dry. This type of skin is actually quite normal, because the T-zone is the most exposed area of your face and needs greater protection against the elements. How can I care for my combination skin? It’s important to use skincare products that are specially formulated for combination skin. After cleansing, make sure you restore your skin’s moisture balance with a moisturiser such as NIVEA Visage light moisturising day cream (for normal and combination skin). Most combination skin tends to lean towards either the oily or dry side so keep an eye out for products labelled as ‘dry/combination’ or ‘oily/combination’ to suit your skin. Oily skin tends to get quite shiny, and looks and feels greasy even when you’ve washed or cleansed your face. The more oily parts of your face are prone to impurities and larger pores, and people with oily skin sometimes find it harder to keep make up in place (setting it with powder can help this issue). How can I care for my oily skin? Dry skin is a bit more sensitive to certain outside influences, such as changes in temperature, exposure to the sun and slightly harsher skin products. It lacks moisture and natural oils, which is why it looks rough and patchy, and sometimes shows signs of premature ageing. How can I care for my dry skin? Replenish your skin with specially formulated lotions and creams to support the protective barrier of the skin and restore the moisture balance. Rich creams with natural oils such as almond oil are ideal for dry skin. 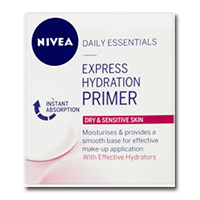 Why not try NIVEA Express Hydration primer for dry and sensitive skin? It contains natural almond oil and calendula extract to nourish and hydrate your skin. Normal skin has good circulation and causes few problems. Smooth and soft with a rosy complexion, it feels equally balanced (not too dry or too oily) across all areas of your face. It’s vibrant and elastic, but like all skin types, normal skin needs moisture and protection to keep it healthy. How can I care for my normal skin? It is important to maintain your skin’s moisture balance with a suitable cleanser and moisturiser. A facial scrub can help keep your skin clear by removing dead cells, leaving your skin looking radiant and fresh. 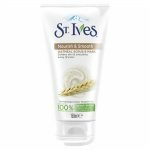 The St Ives Face Scrub is a great place to start. The gentle face scrub is made with 100% natural exfoliants including walnut shell.